Cutting boards are among the most overlooked culinary heroes. So many of us unthinkingly put up with generic plastic slabs or flexible sheets that curl up at the edges and refuse to lie flat or, worst of all, textured glass cutting boards. The only benefit of these store-bought cheapies is that you can stick them in the dishwasher. 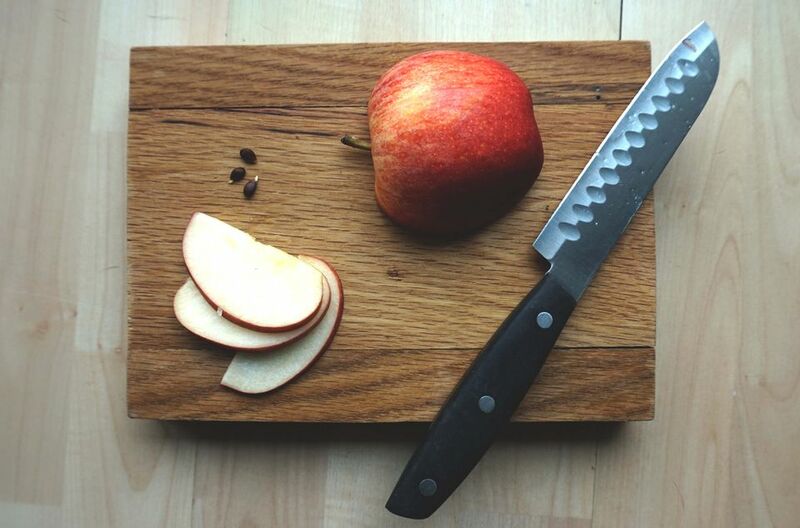 When it comes to cutting anything, a solid hardwood cutting board puts them all to shame. And if you make your own custom wood cutting board, you'll enjoy it that much more. This simple project requires little more than cutting a few wood strips and gluing them together, then sanding it all smooth and oiling the finished product. You get to choose the wood type, mixing and matching as you like, as well as the overall size and shape of the board so it's just right for the way you cook. Choose at least two pieces of hardwood for your cutting board. The wood species, colors, and sizes are up to you. While almost any common hardwood will do, maple is one of the favorite wood types for cutting boards because it offers a good balance of overall hardness and a somewhat yielding surface that is more pleasant to cut on than super-hard woods like walnut or ipe. Decide how you’d like to arrange your wood pieces for the board. You can keep it simple by sticking with a few matching strips or add some contrast with alternating colors. To make it easy to sand and finish the board, plan to orient all of the pieces so the wood grain runs in the same direction. It also helps if all of the pieces are the same thickness, although you can sand out slight variations. Fit the pieces together to see how well the edges line up. If there are any gaps, cut fresh edges, using a table saw or a jointer. You can do this yourself if you have the tool and skills, or you can have it done by a friend or at a lumber yard or maker space. The mating edges of the pieces must fit together perfectly so there are no gaps when you glue up the board. Do not sand the wood because this will create rounded surfaces rather than flat, sharp edges. Once the side edges of the pieces are in good shape, cut the pieces to a matching length, using a manual or powered miter saw. Apply wood glue to the edge of one of the mating pieces for each board joint (you will mate a glued edge to an unglued edge), following the glue manufacturer's directions. The glue should form a thin layer that completely covers the wood edge. Note: Be sure to use food-safe waterproof wood glue, which looks much like standard white glue but is yellow. Do not use polyurethane glue (such as Gorilla Glue). Arrange the glued pieces face-up on a flat work surface, and press them together so their ends are perfectly flush. Clamp the pieces with at least two bar clamps, apply an equal amount of pressure with both clamps. As you clamp, check the top surfaces of the boards and adjust them as needed so they are flush with one another. It's better to have them flush on the top than on the bottom. Let the glue dry as directed. Most wood glues should be clamped for at least 30 minutes, but longer is better. You can remove the clamps after the glue has set, but do not do any work on the board for at least 24 hours. Scrap off hardened beads of wood glue with a wood chisel, as needed. Sand the board until all of the surfaces are uniform and smooth. If you don't have an electric sander, use sandpaper and a sanding block for the flat surfaces. A block helps keep flat surfaces flat. You can sand by hand on edges and corners, if desired. If you want a softer look, round over the edges with a router or sandpaper. Start sanding with relatively coarse sandpaper (100- or 120-grit), then work up to progressively finer grits until you get to at least 220-grit. Finish the entire board with a food-safe cutting board (or "salad bowl") finish, such as mineral oil, beeswax, or carnauba wax; just make sure it is food-safe. The product you use may come with cutting board seasoning instructions. If not, a general rule is to apply multiple coats, allowing for complete drying after each coat. A clean rag works well to distribute oil and wipe off excess. Once your board has dried, it’s time to get chopping. Be sure to clean your board after each use, and reapply the finish as needed to prevent the wood from drying out. You can wash the board with a mild dish soap and water, but do not soak it in water or put it in the dishwasher, which will ruin the wood.